WBBN Reporter in the above video clip says the apology was definitely made because of Mayor Daley’s remarks! 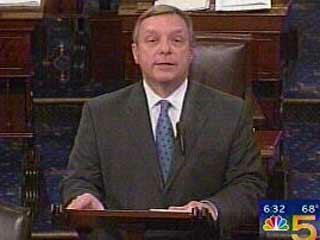 Senator Durbin (D-IL) gave a tearful apology yesterday for comparing the US Military to Nazis. Teary-eyed Senator Durbin from Illinois apologized on the Senate floor Tuesday, for comparing Guantanamo interrogators and US Military personnel to Nazis and other evil-doers. “They’re the best,” he said Tuesday. A news reporter from Chicago’s News Channel 2 WBBM said that he had firsthand information that Senator Durbin made his apology after fellow Democrat, Chicago’s Mayor Daley, who has a son in the military, lashed out at the senator earlier in the day during his own press conference. Mayor Richard M. Daley said Tuesday that U.S. Sen. Richard Durbin should apologize for his recent statements regarding the treatment of prisoners at a U.S. prison camp in Guantanamo Bay, Cuba. “No one has been killed down there (Guantanamo Bay), no one has been seriously injured,” Daley added. Jackson’s Junction also has the video of Durbin’s apology. Bill O’Reilly echoed Powerline on Tuesday night noting the absurd allegations of the Minneapolis Star-Tribune for painting Durbin as a “victim of the right”. And, for the record, although this was not reported before, the St. Louis Post Dispatch did its best to pitch-hit for Durbin in an earlier article this week, as well. Mongo has a few words for the Illinois Senator.